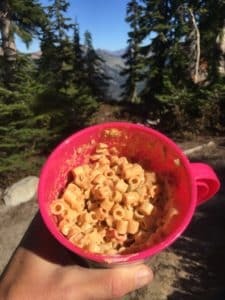 This vegetarian no cook pasta salad was one of the easiest backpacking recipes to prepare during my my thru hike of the Oregon Coast Trail. Freezer bag style recipes, such as this one, can be prepared in a matter of minutes at home and just as easily while backpacking. 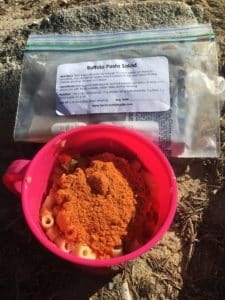 Add ingredients to a baggie or container at home and add cold water on trail. It’s truly that easy! For the meat eaters, foil pouch or freeze dried chicken may be added to boost the protein content of the recipe. Be aware, however, that foil pouch chicken provides approximately 90 calories and 19 grams protein per 3 oz pouch at 30 calories per ounce. Freeze dried chicken, on the other hand, provides 170 calories and 25 grams protein per 3/4 cup serving at 140 calories per ounce. Also keep in mind that while in bear country the smell from an opened foil pouch will be harder to conceal than freeze dried chicken consumed with the meal. 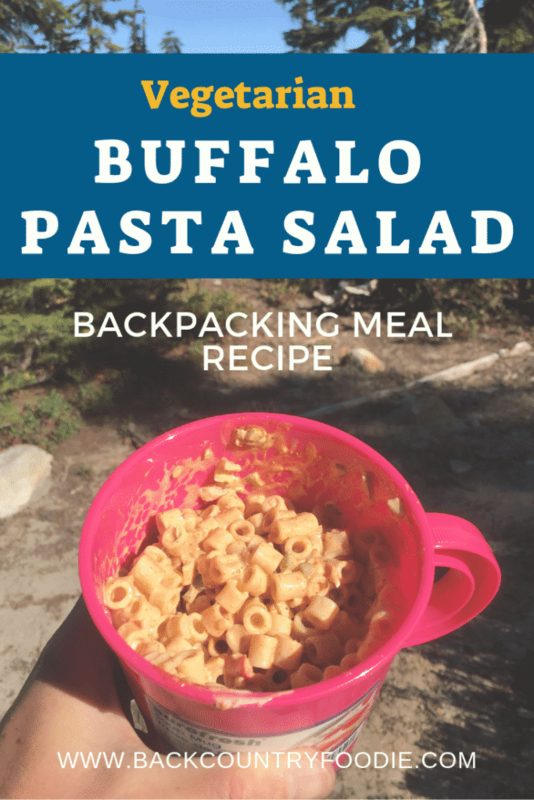 Another perk of this no cook backpacking recipe, is that the ingredients will remain shelf stable for many months without the need for vacuum sealing. 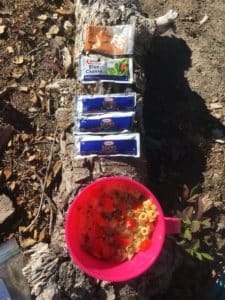 It’s a great option for thru hikers or those of us that like to prepare meals in the off season so that we can spend our time outside during the summer. Hope you enjoy the recipe as much as we do! Put noodles and vegetables in a bag with spices in a separate bag to be stored inside the noodle bag. Pair with 1 (1.5 oz) packet blue cheese dressing and 3 (0.4 oz) packets of mayonnaise. Add enough cold water to cover noodles. Allow to cold soak until fully rehydrated. This will take approximately two hours. Hot water may be used to speed up the rehydration process. Consume or properly discard water after meal is rehydrated. Add spice packet and salad dressing packets. 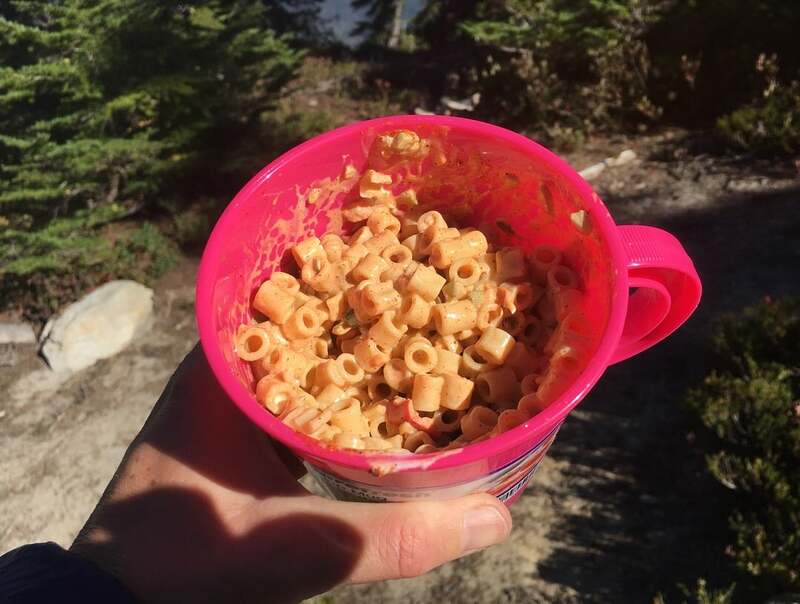 Macaroni noodles: The noodles can be cooked while in the backcountry without pre-cooking and dehydrating at home. Allow for additional cooking time and adequate fuel to do so. Buffalo Wing Sauce: Dry sauce mix can oftentimes be found in the dry sauce packets aisle in grocery stores. A variety of brands are also available via Amazon.com such as Buffalo Wing Wings, Lowry’s or Bexten’s Best brands. For more recipes like this one, check out our Ultralight Recipes for Outdoor Explorers Cookbook in digital format. We also recommend checking out one of our favorite backpacking ultralight dessert recipes. This one is AMAZING! We guarantee you’ll want to eat the entire batch BEFORE dehydrating!